Two goals with goalkeepers are set up facing each other diagonally (about 40 yards apart). Players are divided into two groups of equal size. Each player has a ball. Each group stands facing one of the goals. A shooting line is marked off about 16 yards in front of each goal. Exercise 1: Players dribble straight toward the goal and shoot. Exercise 2: Players include a fake on the way to the goal. 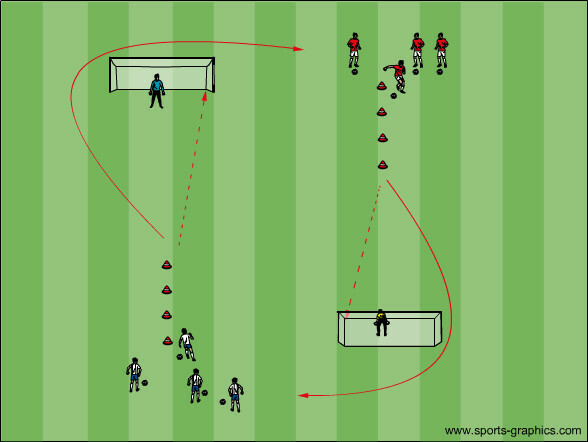 Exercise 3: Players push the ball forward a few yards, then catch up with it at the line and shoot. 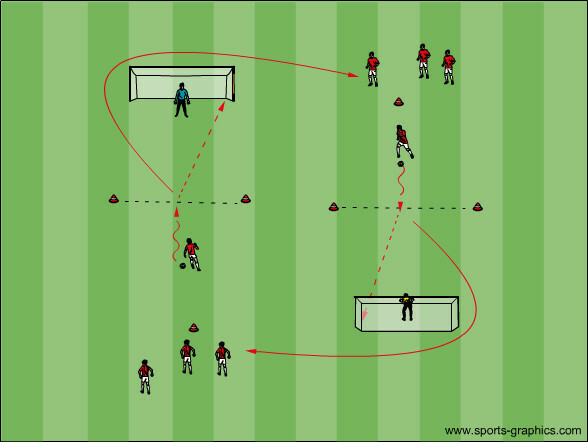 Exercise 4: Players juggle as they move up to the line, then volley at the goal. A slalom course is set up in front of each goal. Exercise 1: Slalom dribbling and shot on goal. Exercise 2: Same as above, except the slalom course is set off to one side. Exercise 3: Slalom dribbling with right/left foot only.